A quality that successul RE/MAX professionals share is community involvement. RE/MAx Associates are mindful of the impact they make locall, not just in real estate but as caring citizens. Over the yeard, our Associates have distinguished themselves as stewards for the betterment of their communities, concerned not only with contribution to their communities but also with the outcome of the contribution. These qualities – known as RE/MAX Premier Community Citizenship – are a dynamic part of the RE/MAX organization. Community involvement is highly valued at all levels of the RE/MAX organisation. 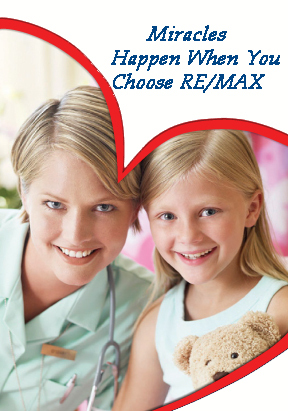 RE/MAX is the sole real estate corporate sponsor for the Children’s Miracle Network and a co-sponsor of the Breast Cancer Survivor Recognition Program. Committed to community involvement, the RE/MAX network serves the public beyond its real estate needs. Why list your home with a RE/MAX Sales Associate? Miracle Network in Ottawa. In addition to the RE/MAX Miracle Home Program, Sales Associates, Brokers, Broker-Owners, Managers and Support staff, fundraise throughout the year with a variety of events such as golf tournaments, casual dress days, silent auctions and raffle ticket sales. RE/MAX Ontario-Atlantic Canada Inc. is proud to support breast cancer initiatives that will make a difference through its involvement with the Canadian Breast Cancer Foundation’s Ontario and Atlantic Chapters. RE/MAX is proud to be a part of the fight against breast cancer. This is RE/MAX’ chance to make a difference. Through the RE/MAX network, we reach thousands of people each day, including our broker-owners and agents, as well as clients, suppliers and friends. It makes sense to utilize our resources to improve the lives of others and foster hope. Our support of the Canadian Breast Cancer Foundation can and does change lives. Through the support of organizations like RE/MAX, significant progress has been made in creating a future without breast cancer. Since 1993, the number of new breast cancer cases diagnosed among Canadian women each year has stayed about the same, and the number of Canadians dying from breast cancer has been declining steadily. The most recent actual data available, from 2000, shows the number of Canadians dying from breast cancer is the lowest it has been since 1950. We, at RE/MAX have always taken an active role in helping others in our community. Many of us have seen, first hand, the difference we’ve made. We’ve helped millions of children since 1992 through Children’s Miracle Network. This is our chance to strengthen Canadian families even further. Let’s make sure that our mothers, daughters and sisters never experience the realities of life with breast cancer. And let’s not forget that men are also at risk of developing this disease. Now is our opportunity to make a difference. Let’s help the Canadian Breast Cancer Foundation create a future without breast cancer. Together we can make miracles happen for children in your neighbourhood! RE/MAX real estate professionals also take an active role in creating a future without breast cancer through the RE/MAX “Sold on a Cure” program. The program will raise vital funds and awareness for the Canadian Breast Cancer Foundati on in Ontario and the Atlantic provinces. “Sold on a Cure” will allow RE/MAX real estate professionals to voluntarily make a donation from the sale of each home directly to the Canadian Breast Cancer Foundation. The funds raised by “Sold on a Cure” in Ontario are directed to CBCF – Ontario Chapter’s Primary Prevention Research program.RE/MAX real estate professionals give additional support during the annual Canadian Breast Cancer Foundation CIBC Run for the Cure. Team RE/MAX participates in the run/walk in many communities across Ontario and the Atlantic provinces.